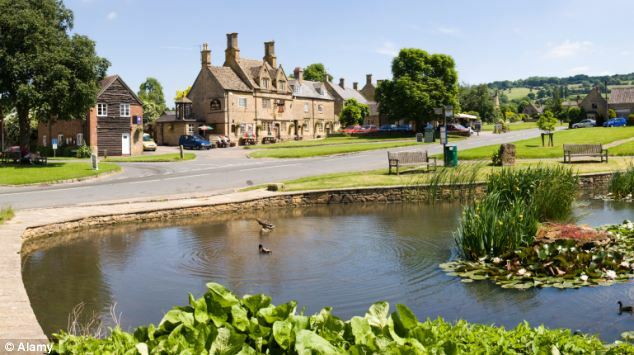 The Bell Inn is an impressive 17th century Cotswold stone building in the centre of the village. Its sign is a depiction of a large bell and the pub has a wooden bell tower to the left as you look at it. It is open from 11:00am to 11:00pm at weekends and bank holidays. Weekdays 11:00am to 3:00pm and 6:00pm to 11:00pm. You can eat and drink in The Bell but it also provides take away fish & chips. As you can see, it is opposite the village duck pond. Dog friendly. Car Park. Garden. The Bell Inn was originally a fourteenth century farmhouse. It has been a pub for one hundred and forty years and has only had five changes of landlords. A warm welcome awaits you from Sue, Louise and their friendly team. Come and visit The Bell Inn website. The Bell Inn hosts a thriving Golf Society. The Bell was many years ago known as the The Bluebell Inn. When village children had nowhere to go they were invited into a back room and given crisps and a drink of Vimto - a soft drink made from mixed berries. Ice creams also available from the outside bar. We hope you all had a super charity day in aid of the West Midlands Air Ambulance. A massive thank you to everyone who comes, to the bands and to everyone who kindly donates our great raffle prizes. Hope you had a great day and we will be delighted to see you again next year.